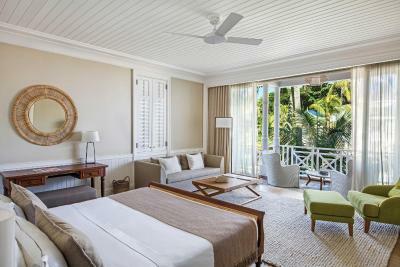 Lock in a great price for Heritage Le Telfair Golf & Wellness Resort – rated 9 by recent guests! I like the place, everything at your hand, clean and peaceful, with alots of activities. Great value. Loved everything. Staff were all keen and proactive. I especially remember Devin from the ice cream shop and Mukesh from Ginja Restaurant because they really did a lot to make sure that we were comfortable. Honestly we felt everyone is doing their best to that end. Staff were very friendly and they made us feel at home. 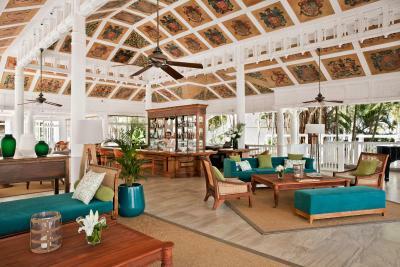 The hotel has recently gone through a major refurbishment making it look really good. Even though our room was one of the basic sea front rooms, it looked fantastic and there was plenty of space inside. We made use of the free hire of the bikes to cycle along the coast which was stunning. The hotel was right on the sea. Breakfast buffet had a massive selection of food and was very tasty. The hotel room is new, comfortable, and luxurious. The mattress is excellent. The room is much better than the photos. The staff is very polite, helpful. They are always smiling. Staff welcoming and of a high standard. I would go back for sure and recommend the hotel. Great location and a premium looking resort. We were amazed by the style and architecture of the place. Beautiful nature. Proximity of the beach and available water sports. 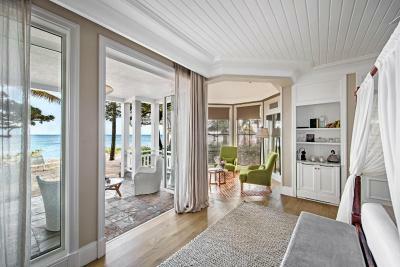 Beautiful room with a view on the sea/beach and the pool side. Everything! First of all the resort is beautiful. Colonial architecture sandwiched between a river and the sea and surrounded by lush tropical greenery is something found in pictures. The staff is simply AMAZING. Bhavesh, Ashni, Vaishna, Yogeeta, Chef Azan, Dhaviesh and Shalini at the Cavendish Bar, Neha at Kids Gourmand made each day of our stay extra special with their care and warmth. We all felt genuinely sad to leave a beautiful place and some lovely people behind. The facilities were outstanding -catering to the needs of the family beautifully. The activities for both kids and adults were well thought of and were mostly free. The food, for the most part, was outstanding, especially food at Ginza, the steakhouse and the Chateau. 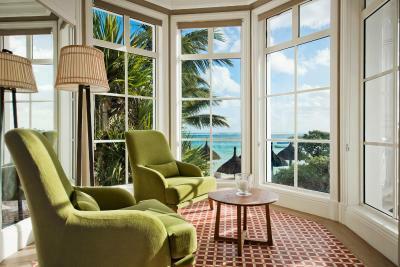 If you are visiting Mauritius don't hesitate to book your stay here. You will leave with lifelong memories. We are definitely coming back. kids club was great, quiet ac units, great location, gorgeous architecture, helpful staff, rooms close to pools and beach. 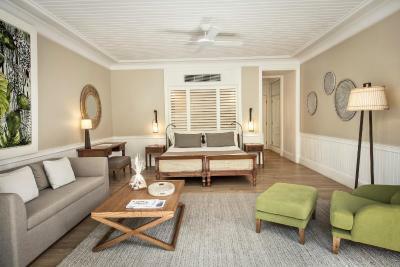 Heritage Le Telfair Golf & Wellness Resort This rating is a reflection of how the property compares to the industry standard when it comes to price, facilities and services available. It's based on a self-evaluation by the property. Use this rating to help choose your stay! 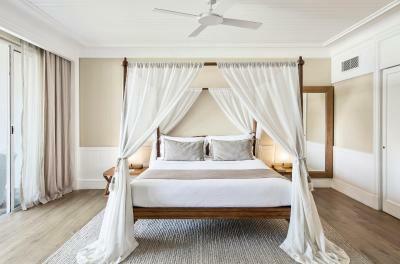 Inspired by the 19th-century architecture, this elegant hotel is set in tropical gardens on the south coast of Mauritius. 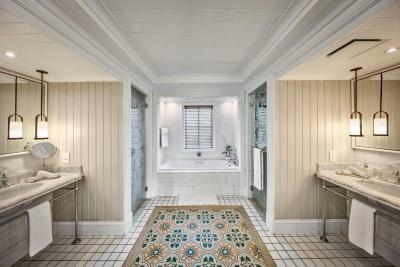 It features a 1969 ft² pool, spa and an 18-hole golf course. 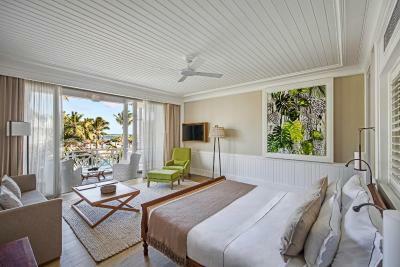 Heritage Le Telfair Golf & Wellness Resort offers stylish, air-conditioned rooms with interactive flat-screen TVs and data ports. Mini-bars with tea and coffee making facilities are also standard. The resort features 2 restaurants. Mediterranean barbecues can be enjoyed at Le Palmier, by the swimming pool. 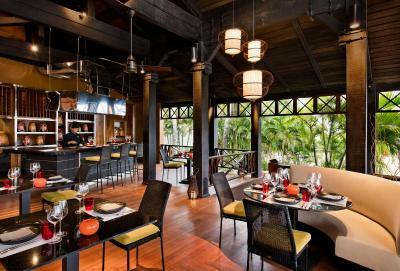 The beachfront Gin'ja serves Pan-Asian cuisine in a relaxed setting. Pedal boats, snorkeling trips and water-skiing sessions are available at a surcharge. 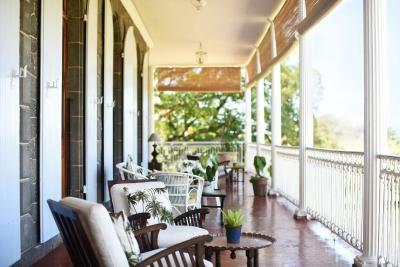 Guests can also take a walk in the garden or relax by the Citronniers River. Other relaxation options include a hammam and fitness center. 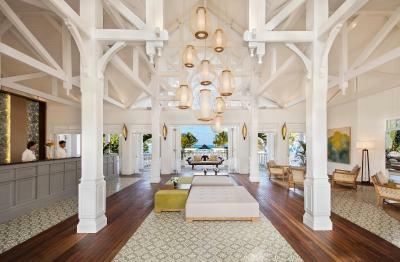 When would you like to stay at Heritage Le Telfair Golf & Wellness Resort? 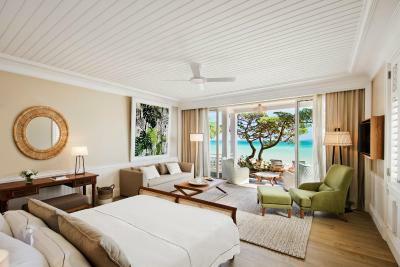 This beautifully decorated and stylish room comes with an ocean view, air conditioning and an interactive flat-screen TV. Equipped with a mini-bar, tea and coffee making facilities and free WiFi. 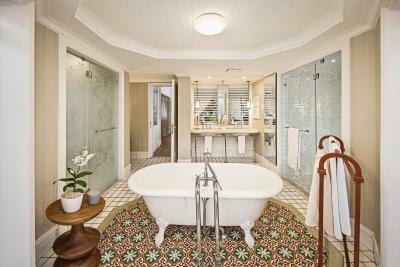 Each room has a spacious private bathroom with bath, separate shower and toilet. 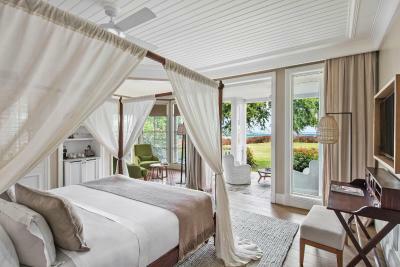 The room can accommodate 3 adults or 2 adults and 2 children up to 12 years old. 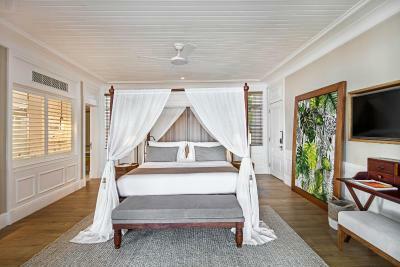 With balcony or veranda and river views, this beautifully decorated and stylish room comes with air conditioning and an interactive flat-screen TV. 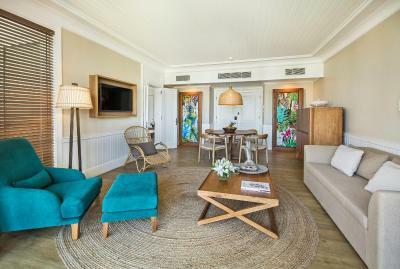 With balcony or terrace and panoramic beach view, this beautifully decorated and stylish room comes with air conditioning and an interactive flat-screen TV. These suites are located on either the first floor or the ground floor and are subject to availability. 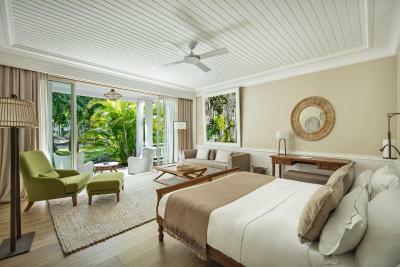 This air-conditioned suite features a balcony, a lounge and dining area. 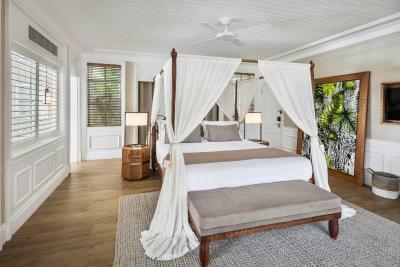 With antique furniture and canopy beds, this suite also has an private bathroom and there is a spacious dressing room. 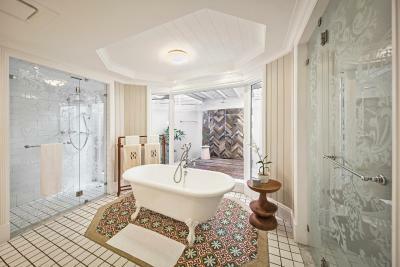 The suites that are located on the ground floor feature an outdoor shower. 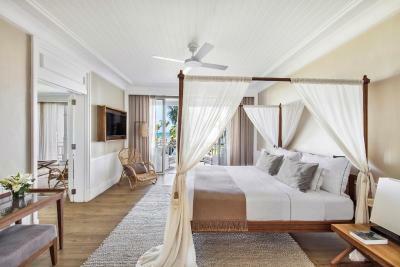 This stylish room comes with an ocean view, air conditioning and an interactive flat-screen TV. 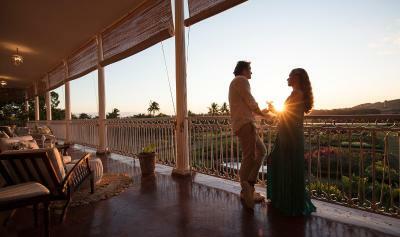 It is equipped with a mini-bar, tea-and-coffee making facilities and free WiFi. 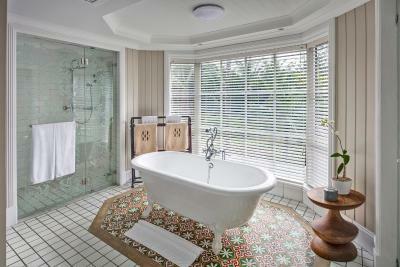 Each room has a spacious private bathroom with bath, separate shower and toilet. 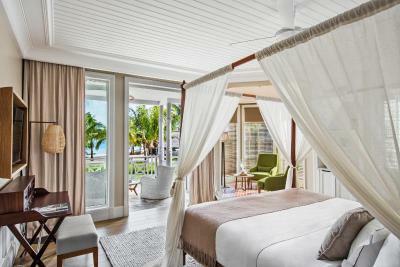 This suite features a balcony, mini-bar and view. 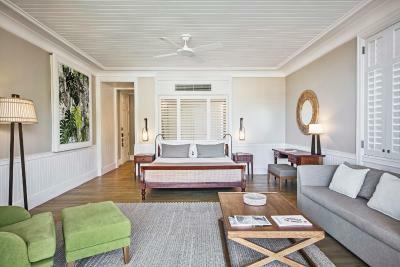 Guests of this room benefit from unlimited, free Green Fees at Heritage Golf Club and the daily use of a golf cart. This suite has a balcony, dining area and sofa. 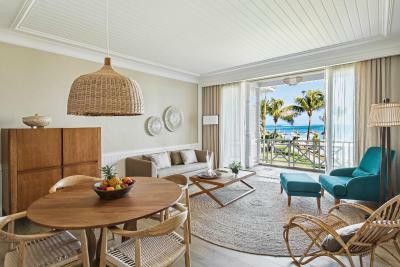 House Rules Heritage Le Telfair Golf & Wellness Resort takes special requests – add in the next step! 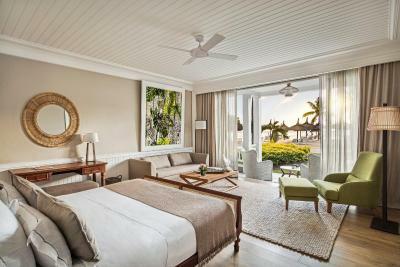 Heritage Le Telfair Golf &amp; Wellness Resort accepts these cards and reserves the right to temporarily hold an amount prior to arrival. Heritage Le Telfair Golf & Wellness Resort accepts these cards and reserves the right to temporarily hold an amount prior to arrival. The charges below are not included in the overall room rate. Guests will be charged separately at the hotel reception. The mandatory Christmas Eve gala supplement on 24 December costs EUR 185 per guest older than 12 years and EUR 95 for children 2 to 11 years of age. The mandatory New Year's Eve gala supplement on 31 December costs EUR 185 per guest older than 12 years and EUR 95 for children 2 to 11 years of age. Please note that there is limited or no access to Heritage Golf Course from 25 November 2019 to 08 December 2019. Please note that there is no access to C-beach Club from 01 December 2019 to 08 December 2019. 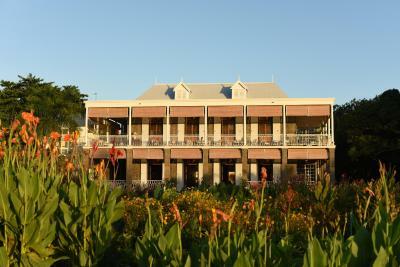 Please inform Heritage Le Telfair Golf & Wellness Resort of your expected arrival time in advance. You can use the Special Requests box when booking, or contact the property directly using the contact details in your confirmation. I think the staff at the Kids and Baby club can be improved upon. Booking outdoor activities through the hotel was a bit more expensive that doing so through the web with local companies. Had an awesome experience, the staff as well as everyone in mauritius was very kind and friendly. Each room is assigned a host that is always ready to assist you with any issue and help you organize either indoor or outdoor activities! In our case we were assisted by khem and melvin and both provided an excellent service! Moreover, the heritage domaine includes not only the hotel but also a golf court, a natural reserve and a chateau, all beautiful places to visit, eat or drink something! Heritage le telfair’s beach is nice but i do recommend getting to know some others too as you will find a lot of beatiful beaches in mauritius. Also i recommend swimming with dolphins and touring the southwest of mauritius which offers stunning landscape sightseeing spots and cultural places. All in all, an excellent experience. 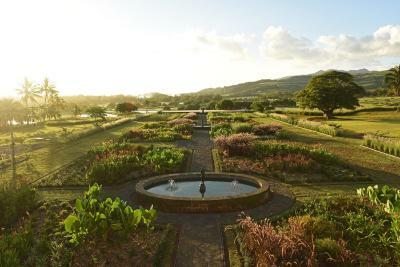 The property, architecture, land and signature smell of Le Telfair are great. If you could remove the management and obnoxious amnesiac stuff the place could properly start resembling something else than retirement facilities..
the welcome gift at the room should comprise fruits. Entertainment in the evening could be improved. The breakfast rooms and the breakfast. The Golf club being part of the Hotel without green fees. The fast transport system to golf court and this very beautiful Golf court ! Extra charge for small things (unexpected), outrageous price for drinks. 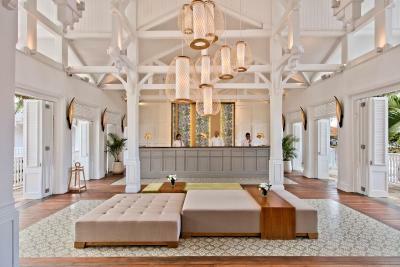 Quality of the resort, friendly staff, lovely spa, tasteful design, luxurious feel. Very spacious room. We had a good time at the spa and really enjoyed the massage. More Information about what nights were buffet nights and which location. The Hosts, could do more to promote the Chateau for Lunch & dinner, we only found out about this beautiful place from another guest. When we attend the Chateau for lunch we were the only guest, which seemed a real shame, but we took advantage of having the entire place and the luncheon banquet to ourselves. This was a combined trip for our Wedding anniversary and my 50th. The resort went over & beyond to make our experience memorable, complimentary champagne, dinner & roses. On returned to our room the night of the anniversary dinner our bath was filled with bubbles and rose petals on our bed. I was spoilt with champagne for breakfast on my birthday and a wonderful chocolate cake with the staff gathering to sing as the cake came out. It was a fabulous night. We are both vegetarian, and the chefs went out of there was to take us around the buffets and point out what we could eat, they always offered to make us something special. The food was a little on the expensive side coming from Australia & the exchange rates, the quality/variety meant we were never disappointed and so in our mind was well worth the extra expense, a bonus was the exception live evening music . The activities were abundant, we found ourselves doing 4 - 5 of the activities on the program each day, including visiting the fabulously well equipped gymnasium (all of which were free). Some of the activities we did were, Pilates, Yoga, Tai Chi, Aqua Gym, relaxation and breathing exercises and various gym classes. We also enjoyed Stand up paddle boarding, and kayaking Activities Manager Navin & his team (especially Gael) & the gymnasium were always so helpful and made all of the classes they took so much fun at the same time being physically challenging. Ravin at the wellness centre was such a charming, happy man & we so enjoyed his classes, he even managed to make my husband enjoy a Pilates with a swiss ball class. As we are into physical fitness these guys truly made sure our holiday enjoyable Thanks Guys. Finally, Ashnie was our hostess assigned to our room, she went above & beyond to ensure everything was o.k in our room, everything we need was available to us, checked in everyday to ensure we were happy. Good location,amazing accommodation, very high standard of service with many different restaurants, great and positive staff,always taking care for any wish of the guests.